Chag Sameach, Chaverim. Tonight is the 1st night of Hanukah. 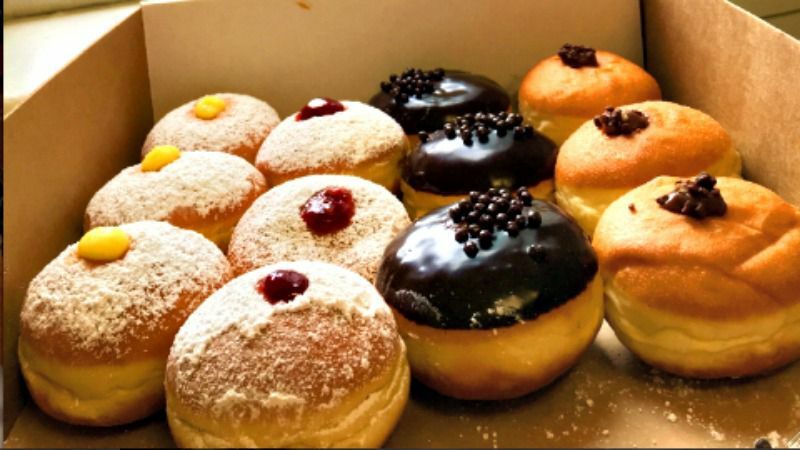 You may not know this, but one of the traditional foods of Hanukah are jelly doughnuts. Now you know why I love this holiday. is this the eight day thing? i did that with a college friend one year, i made it to 6 of the eight nights at his folks home. i thot the foods would be more..interesting. donuts? LOLOL. Or, as Adam Sandler puts it, "Eight Crazy Nights". Now look what you made me do , I gotta post the Hanukah Song again. You spin the dreidel for gelt. They may look like gold coins, but they're just chocolate wrapped in foil.